Saint Rosalia, also called “La Santuzza” in Sicily, is the patron saint of Palermo. Here I’ll tell you a concise biography of Santa Rosalia and what is the “festinu” (feast of Saint Rosalia). No other woman is so beloved as Palermo’s own Saint Rosalia. When you come to visit, you’ll see her image everywhere you look. Of course, you’ll find her in churches, but I’m talking about everywhere. 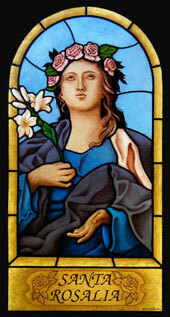 Our Saint Rosalia is beautiful in all her different representations. Today, she rests in the Monte Pellegrino Hermitage. Her bones are kept in the reliquary of the Cathedral. And you can find the lovely Van Dyck portrait of Saint Rosalia that is on display in the Palazzo Abatellis. Wherever you find her portrait, you’ll find flowers offered about her image. According to legend, when Saint Rosalia performed miracles, bystanders noticed the sweet odor of flowers that emanated from her presence. For those of you who are interested, I’m gonna tell you a short recap of the life and work of Saint Rosalia. Old Don Tano is pretty old, but not old enough to be present at any of the famous miracles performed by our own Santa Rosalia. But I read you know. Besides, here in Palermo, everybody knows the legend and all the stories that surround the lovely Saint Rosalia. Our Lady was born in 1126 right here in Palermo, a daughter of the aristocracy. Her father was Count Roger I. In those days, it was normal for the parents to arrange suitable marriages for their children. But Saint Rosalia refused to accept a husband from the many choices offered her. She felt a greater, more important call, so instead of allowing herself to be married, she cloistered herself in a convent. But soon felt that there was too much gossip and petty jealousy much like it had been at court, so then Saint Rosalia installed herself in a little cave. The cave in Pellegrino Mount was the property of her father. Saint Rosalia was to remain in her cave until her death. But during her lifetime she performed a number of miracles. During a 1624 plague, in one of her most famous appearances, she showed herself to a soap maker. She bade him suggest to the cardinal that her bones be brought to a procession so she could stop the plague. Today she is our Sicilian heroine and The Festino di Santa Rosalia (The Feast of Saint Rosalia). 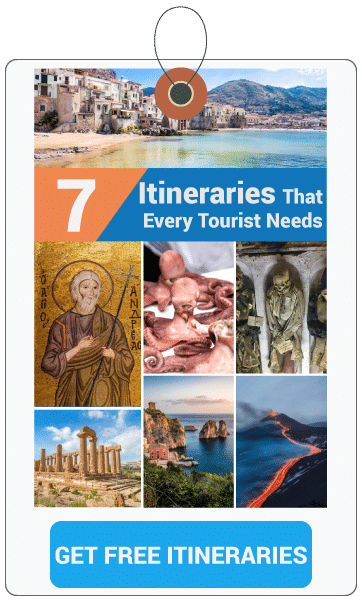 Many visitors including traveler scientist Patrick Brydone, insist this is the most beautiful popular feast in all of Europe. These colorful festivities take place on the evening of July 14th when Saint Rosalia’s relics resting in a grand chariot are paraded from the Old Town to the Marina, culminating in a grand spectacle of fireworks. The most outstanding feature of the procession is the magnificent chariot. Shaped like a vessel it houses the statue of the Santuzza (Little Saint). Each year a new chariot is constructed just for this momentous event. Actually, the chariot is the equivalent of a moving stage. It is about thirty-three feet long and wide. Oxen pull the chariot (although originally we understand elephants did that job). Roses, angels, putti (cherubs) and Tritons blend together in gold and baroque colors decorate this wonderful chariot, while people continue to dance around the procession creating their own amazing choreography with lighting effects. The following day (July 15th) Saint Rosalia’s relics are carried all around and finally returned to the Cathedral to be blessed by the Archbishop of Palermo. 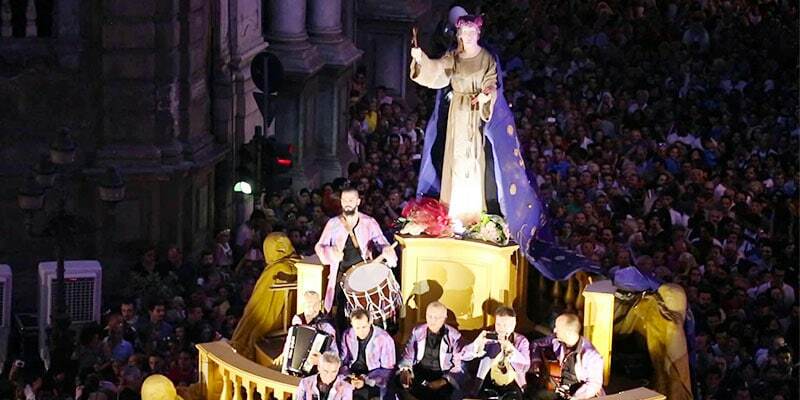 If you do get to come to Palermo during these festivities and fail to attend — well, that would be a mortal sin’. I’ll come to your hotel in person and make you drink Marsala until you pass out! So be careful! This is one show you’ll never see anyplace else; only here in Palermo. As an added bonus, during the festival, the Old Town fills with street food vendors who offer the best dishes on the Sicilian menu. One serious word of caution from old Don Tano: Whenever you find yourself in a very tightly crowded area such as the Festivities of Saint Rosalia, you’ll find it is also Christmas shopping day for the pickpockets. Be very careful and leave any valuables in the hotel safe. If you have any questions, please don’t hesitate to drop a comment below and I’ll be happy to help you.